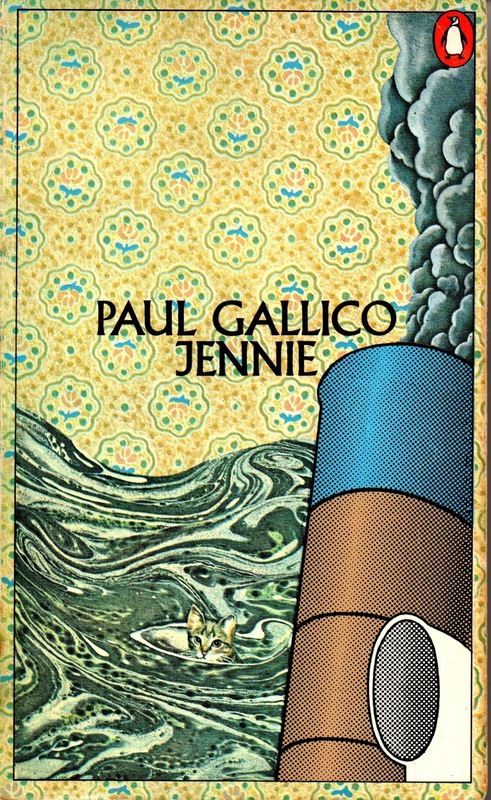 Paul Gallico’s Jennie (1950) was first published in the US as The Abandoned. It’s a fantasy novel that will appeal especially to cat-lovers but also to readers with a heart in the right place. Many of Gallico’s works are unashamedly sentimental, and I feel that the world’s better because of that. It starts with Peter in bed after a traffic accident – he’d been running across the road after a tabby striped kitten when he was hit by a vehicle. Then when he wakes up, he realises he is a cat, no longer a boy, and Nanny chases him out of the house! So his adventure begins. Almost immediately he encounters a nasty yellow tom cat, Dempsey, who brutally savages him for ‘trespassing’. Badly cut and battered, Peter is nursed back to health by a small tabby with an enigmatic smile – Jennie. When Peter explains his predicament, Jennie believes him, simply because he doesn’t exhibit any of the normal traits of a cat. She sets about teaching him how to be a cat. ‘Oh, dear,’ said Peter, who never did much enjoy having to learn things… (p36)Typical boy, then. Apparently, Jennie’s ancestors were from North Africa; several of them were ship’s cats in the Spanish Armada; her mother’s ancestor was wrecked on the coast of Scotland. Of course his descriptions of cat behaviour are not the only little gems. Good writers are observant: ‘Everywhere the geraniums in their pots were full, rich, ripe, and blooming juicily, the leaves thick and velvety, and each blossom shedding fragrance so that the room was filled with the sweet, pungent, and slightly peppery geranium scent. And it’s a tale of bravery: notably when Peter faces Dempsey again in a near-fatal fight. Incidentally, Gallico began his writing career as a sports writer in 1920; he had an interview with boxer Jack Dempsey in which he asked Dempsey to spar with him. He then described how it felt to be knocked out by the heavyweight champion! Among the many books Paul Gallico wrote, the most famous are perhaps Thomasina, The Snow Goose, The Adventures of Hiram Holliday, the charwoman Mrs Harris series, and The Poseidon Adventure. He died in 1976, aged 78. History is filled with quirky characters, larger-than-life people, and the Old West has more than its fair share of them. In the UK the Broadmoor Criminal Lunatic Asylum was established in 1863. Nowadays, Broadmoor Hospital is a high-security psychiatric hospital with about 200 patients. What has this to do with the Old West? Only the name: the Broadmoor Casino was built by Count James Pourtales in 1891 near Pikes Peak in central Colorado. Many people thought he was mad to undertake the project! The count, a German nobleman, was seeking good investments and bought into a huge dairy farm near Colorado Springs. Then the mad idea took hold. He decided to found a resort town on part of the property. He built a pleasure palace to lure buyers of lots. This ‘palace’, the Broadmoor Casino was on the shores of a 15-acre artificial lake that was stocked with trout. There were 32 Corinthian columns gracing its exterior, and its rooftop terrace offered a splendid view of the mountains. Inside there was a grand foyer, a double staircase leading to a grand ballroom and a concert hall, three dining rooms and a salon for the ladies. Pourtales sited gaming rooms on the first floor. He intended to make profits from the sale of the liquor he supplied to the gamblers; he didn’t risk house funds on the games themselves. Method in his madness: Colorado Springs was a dry town. A resident orchestra comprising European musicians played regularly; food was provided by a French chef. Incredibly, he hired a lady parachutist to promote the resort: she landed in the lake but survived. The grand opening of the casino was on 1 July, 1891. However, Pourtales’ mad dream of a new township, Broadmoor City, wasn’t realised, since few wealthy punters bought lots. The Panic of ’93 depressed Colorado’s silver mining industry, which didn’t help, and within a short time Pourtales, burdened by the immense expenses that the Casino incurred, was declared bankrupt. Four years later, the Broadmoor Casino was destroyed by fire. Inspired by this fascinating snippet of history, I decided to incorporate certain elements in my noir novel Coffin for Cash. My nobleman is Baron Hans von Kempelen, aged 55. He is the owner of the Lenore Casino, near Green River. Long before they reached the entrance to the casino complex, Cash and Corman rode past dozens of white-painted wooden posts, all lined up neatly: “Setting out the lots for the baron’s town plan,” Corman explained. Finally, an entrance arch of Doric columns declared “The Lenore Casino”. From here curved a wide drive bordered with sagebrush flowering yellow, red, pink and orange; mixed with these were sego lily and larkspur. The drive led to a long two-storey building, its veranda graced with a series of Corinthian columns. A rooftop terrace commanded a view of the surrounding countryside, and above the entrance doors, rising from the centre, was a latticework tower with a huge clock-face showing Roman numerals; a big metal pendulum swung below, partly visible through a long narrow window above the entrance. They tethered the horses at a hitching rail at the front steps. A good distance away on their right was a marble edifice, with a life-size winged angel on top. Then without saying more he led Cash up the steps and through the double doors. To one side was a Chinese sentry dressed in black and gold livery, brass buttons to his throat. He carried a sword at his belt but made no move to challenge Cash, recognising Corman. They entered an atrium clad in dark oak panels, the floor tiled with patterned marble. A double staircase swept to a landing with a series of double doors. “Up there,” Corman pointed, “is a ballroom, a concert hall and a couple of dining-rooms, a salon for the ladies and the baron’s private rooms.” The landing was almost on a level with the clock’s metronomic pendulum. Smartly dressed men and women strolled through the atrium, arm in arm, none of them taking any notice of Cash and Corman’s trail-dusted attire. Several Chinese in black and gold costumes moved to and fro, carrying newspapers, documents, and silver trays of drinks and cakes. Cash peered up and could distinctly hear the pendulum as it scythed through air. He lowered his gaze and spotted a man striding purposefully towards them. “Meet the baron,” Corman said, removing his hat. Baron von Kempelen was virtually the same height as Cash. He wore a monocle in his left eye, possessed a scar down his left cheek, and sported a Van Dyke moustache, which was as blond as his short-cropped hair. He wore a grey suit of cavalry twill, with waistcoat, and shining black shoes. Cash noted a slight bulge in the vest pocket; doubtless a derringer snug in there. “Corman, who is this with you?” the baron asked curtly. Wiping a hand over his bristly chin, Corman nodded. “Sure, Baron. I need to clean up.” He put on his hat, swung on his heel and went out the entrance doorway. “I noticed your interest in my clock,” the baron said, gazing at the swinging pendulum. He was led to the right, through a double door that was guarded by a huge Chinese man in a smart black and gold suit and a sword with belt. They trod on thick carpets that went through three gaming rooms where patrons played on a variety of roulette wheels or card tables. Chinese male and female staff darted between people, serving trays of liquor. A smoke mist hovered above their heads; the ceiling, where visible, appeared stained. As regular readers will know, I write genre thriller fiction – espionage, crime, horror, fantasy, and western. My first published western book Death at Bethesda Falls was published in 2007 and is now out of print. Five others followed for the same publisher. I also edited a couple of western anthologies. One of these, A Fistful of Legends, (2009) featured the tale ‘Cash Laramie and the Masked Devil’ by Edward A. Grainger. This was the first outing of the character Cash Laramie. Since then, he has gone from strength to strength in over a dozen books, all of them classed as noir westerns. In 2012, I was asked by Cash’s creator to write an adventure in the series; a number of talented authors had already done so. I readily agreed and wrote Bullets for a Ballot, and greatly enjoyed the experience. It was the fifth in the series. 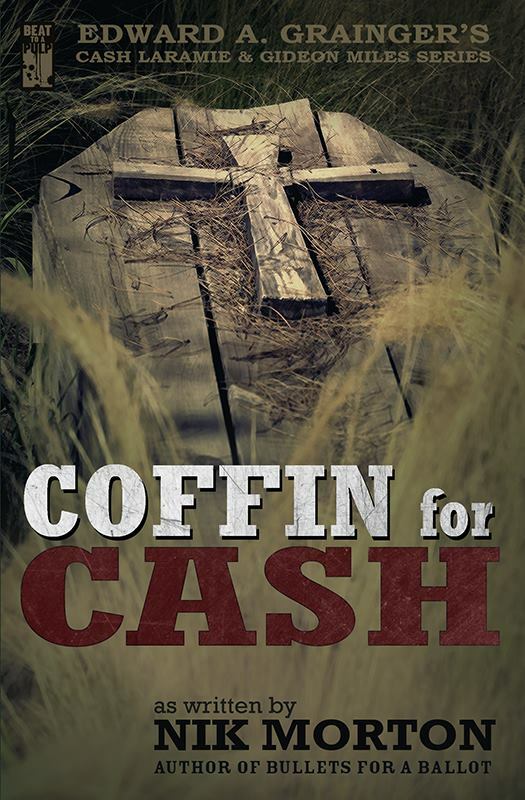 Since then I have written a second adventure, Coffin for Cash, which became the twelfth in the series. Cash Laramie has been in plenty of tight spots, but this – being buried alive – may be his last! His friend Miles is nearby, intent on escorting a suspected murderer to Cheyenne for trial. Yet Miles discovers that his charge might be not guilty, after all, and lingers to ask questions. And those inquiries mean upsetting some people, which leads to an ambush, and a final reckoning at the outlandish casino complex constructed by a wealthy bigoted German baron. Throw into the mix the attractive Berenice, a schizophrenic bank manager, irate miners, Chinese workers, a boisterous slot machine salesman, and a devious lawyer and you have another explosive adventure for the Outlaw Marshal. I’ll return to this book again, to outline the strong influences affecting its story and characters. 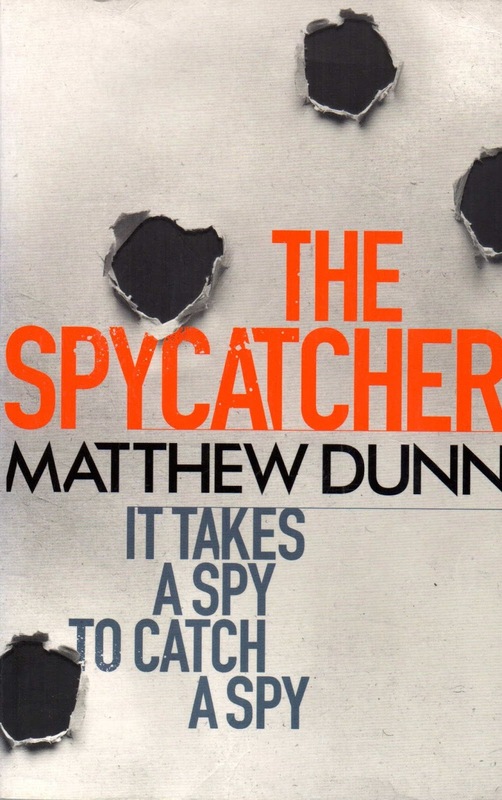 The Spycatcher (2011) is a debut espionage novel by Matthew Dunn, who just happens to have been trained by British SIS, as well as working with units of the SAS, SBS, and MI5, GCHQ and CIA operatives. The credentials are backed up by prose that reeks of insider knowledge. The book was originally published with the title Spartan in hardback and then retitled for the paperback. The hero, Will Cochrane, is known by the code name Spartan. The British Spartan Programme allows only one man to go through the process, and he will be answerable only to the Prime Minister and his controller, Alistair: Spartan is trained to be a lethal weapon. It begins with high tension, in New York’s Central Park, where an assignation turns into an assassination. Cochrane is badly wounded but survives (he would, wouldn’t he?) Part of the mystery that is his life unfolds as he is introduced to a secretive American who just happens to know Cochrane’s controller. The debacle in Central Park involved several agents from Iran. Alistair has learned that the Iranians are planning a massive atrocity in either the UK or the USA. Cochrane’s task is to identify the mastermind, capture him and get him to reveal the intended target. Nothing to it, really. Except, as Alistair says, ‘There is nothing regular about this mission.’ Cochrane is sent to meet a MI6 contact in Sarajevo, who knows somebody who might have a lead on the so-called mastermind. No sooner does he get there than it all goes wrong. But Cochrane has one lead – Lana, a woman living in Paris, who might have known the ‘mastermind’ during the Bosnian conflict. She was a journalist at the time, and came away scarred both physically and mentally. Reluctantly, he enlists her aid in locating her ex-lover, a man she now hates. He is aided by a team of four specialists recruited specially for this mission. They’re tough and soon prove their loyalty to Cochrane. The trail will lead from the freezing streets of Sarajevo to the snow-clad mountain region of New York State and the city itself for the violent denouement. Throughout, we follow the spy’s tradecraft, trailing suspects, killing shadowy agents. These passages are well written, sucking you into the suspenseful story, all the time casting doubt on the ability of innocents to survive. The insider knowledge is evident but never obtrusive. We believe in the apparent invincibility of Spartan. But he makes mistakes; inevitably. Dunn has created a hero readers will willingly follow in subsequent books. Cochrane is flawed, troubled by his past, aching to give it all up and lead a ‘normal’ life, and yet he is a driven soul, wanting to right wrongs, needing to punish those who do evil things. He is not averse to being judge, jury and executioner. The narrative compels the reader to keep turning the pages. That is what every thriller should do; many don’t manage it. Dunn has now produced seven books in the Spycatcher series. Be aware that he has also published two novellas and check the review comments of these. Despite the page-turning ability of the writer, there are certain aspects that should have been addressed by his editors. Almost on every page, somebody’s eyes ‘narrowed’; it became tedious. As for Cochrane’s training, stoic in adversity, it seemed out of character for him to kick the ground (or something else), or stamp his feet ‘in frustration’ so often. The twist was not a surprise and, in a similar vein to Dan Brown, the explanations seemed contrived. Yet, and yet, the sheer verve of the narrative and the strength of the character Spartan carry you through these minor misgivings. That’s not great literature, but it is good story-telling. As for the book title change, that seems significant and worthy of note by budding authors. Spartan was fine, since this was the main character’s codename. However, it smacked of a historical novel, not a contemporary espionage thriller. So, I can understand the change. It became The Spycatcher with the strapline ‘It takes a spy to catch a spy’. However, subsequently it soon became simply Spycatcher and then the next books were referred to as Spycatcher novels. And if you examine some of the titles, some have been subtitled ‘A Will Cochrane novel’. Received wisdom is to create a brand. And yet there’s a lack of consistency here; if Harper Collins (and its imprints) can’t manage that, what chance have lesser mortals, I wonder….